We recommend adding Kigelia Africana powder into clay and using it as a mask. Also, you can make an infusion, allow it to cool off, strain and rinse your hair and face in the shower or simply drink it. Capsules: Take 2-4 capsules a day with water or favorite beverage. 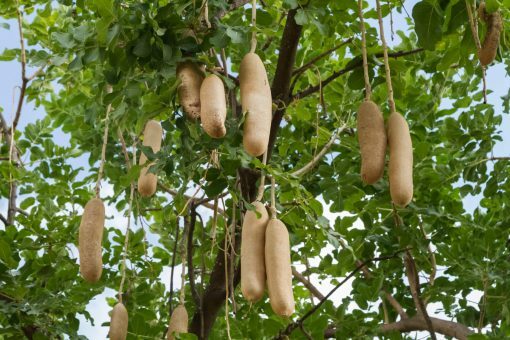 In cosmetics, Sausage Tree (Kigelia africana) has been evaluated for their ability to heal damaged skin and various dermatological conditions. A topical preparation containing Sausage tree is used to remove sunspots on the face and hands, “solar keratosis.” Several patents have been granted for the use of Sausage tree wholesome extracts as anti-wrinkling agents and skin lightening and general skin rejuvenation. A sausage tree wholesome fruit extract is useful to develop the bust and the stability of breast collagen fibers. We recommend adding Kigelia Africana powder into clay and using it as a mask. Also, you can make an infusion, allow it to cool off, strain and rinse your hair and face in the shower or drink it. The Kigelia Africana is found throughout tropical Africa, and there are local names for the plant among the several hundred tribes. Kigelia Africana contains a polymorphous species. It is extremely variable in habit and leaf morphology, which has led to the distinction of up to 10 separate species and many synonyms. Kigelia Africana is a small to a medium-size semideciduous tree, up to 25 m in height. Tribes utilized Kigelia Africana fruit for edema, cancer, rheumatism, snakebites, fevers, malaria, and syphilis, and an alcoholic beverage similar to beer. 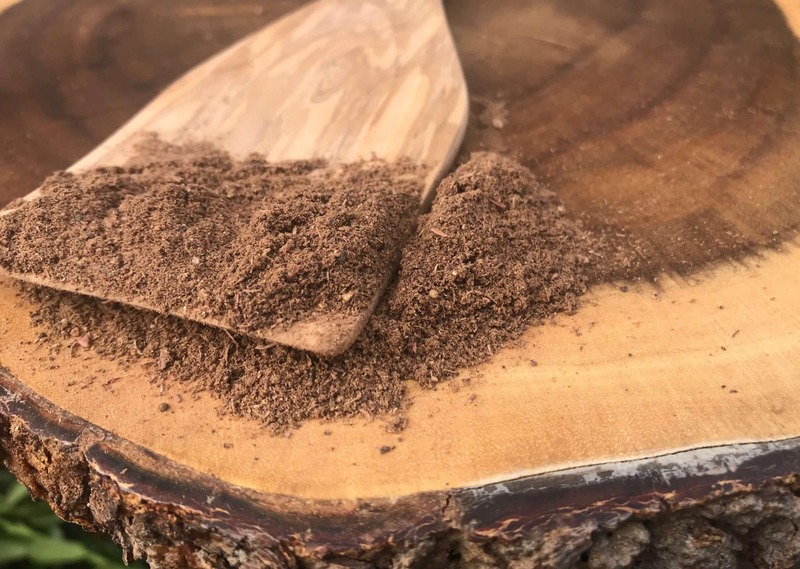 Kigelia Africana stem bark decoction has been used as an aphrodisiac and for the treatment of kidney diseases, solar keratosis, diarrhea, coughs, and inflammation. Sausage tree bark is decocted and administered as an abortifacient. Tribes also used Kigelia Africana for Sexual complaints such as infertility, poor libido, sexual asthenia, and impotence. Kigelia Africana root is a remedy for boils, sore throat, constipation, and tapeworm infestation. Kigelia Africana is also used in the treatment of skin diseases and traditional cosmetics preparations as a skin lightening agent, to reduce wrinkles, and to promote smooth skin. In Nigeria, the ground fresh or dried fruits are formed into a paste and rubbed on the breast to treat “cancer” of the breast or abscess. Wholesome Extracts of Kigelia Africana and isolated compounds have been shown to possess antibacterial, antifungal, antineoplastic, analgesic and anti-inflammatory, antimalarial, antiprotozoal, antidiarrheal, and CNS stimulant activities. The short-term effects of Sausage tree wholesome fruit extract (KAFE) on cisplatin-induced testicular histomorphometric changes in SD rats have been investigated. It was found that cisplatin treatment caused over 37.5% mortality of SD rats. The qualitative histological assessment showed no deleterious changes following treatment with KAFE alone or as pretreatment with cisplatin. KAFE posttreatment resulted in focal vacuolar changes in the seminiferous tubules (STs) of the SD rats. Cisplatin treatment negatively affected the histoarchitecture of these STs, with massive loss of spermatogenic cells. There was also a significant reduction in testicular weight/volume, ST diameter, and cross-sectional areas, but KAFE positively improved these parameters. KAFE alone and as prophylaxis significantly increased body weight, serum testosterone, and follicle-stimulating hormone. It showed a significant elevation in CAT activity, decline in MDA, and upregulation of GSH levels. These parameters were negatively affected by cisplatin treatment. It was suggested that the cytoprotection against cisplatin-induced testicular damage by KAFE is likely via an antioxidant modulatory pathway and also the possibility that KAFE may possess an androgen-stimulating property. The wholesome extracts of Kigelia Africana fruits have been shown to possess remarkable antidiabetic properties. In STZ-induced diabetic Wistar rats, daily oral treatment with the wholesome methanolic extract of Sausage tree flowers and standard drug for 21 days significantly reduced blood glucose, serum cholesterol, and triglyceride levels. The HDL cholesterol level was improved compared to the diabetic control group. Iridoids isolated from Kigelia Africana have been evaluated for a GLUT4 translocation modulatory effect in skeletal muscle cells. 7-Hydroxy eucommiol and three related iridoid glycosides showed significant stimulation of GLUT4 translocation to the cell surface in skeletal muscle cells without any adverse effect on cell viability. The effect of these four compounds was concentration dependent and comparable to the standard drug rosiglitazone. These findings indicate that constituents of Sausage tree may provide leads for the therapeutics for insulin resistance and diabetes.